Let’s be honest, phone and tablet cases are not the most exciting things (unless you’re the one making them!) and there are hundreds of manufacturers out there, each with a variety of designs. So it’s not often that we review cases and covers, it’s too subjective and there’s too many. 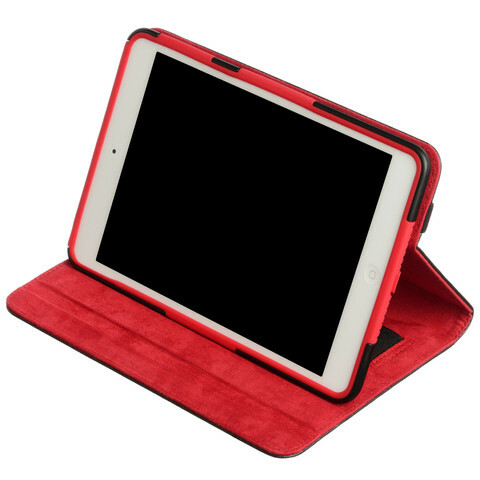 However, now and then we do make exceptions and here in the video below you’ll see the Kujali iPad Mini case. Not only is it an extremely well made case/cover, constructed from black leather, red suede and shock absorbant inner polyeurathane and silicone glove. It’s multimode with a wrist strap to boot. But that’s not the only reason that this case got out attention. No. For every case that you buy from Kujali, they will donate a malaria net to a child in Africa. So buying one could literally save a life! You’re a style conscious passionate guy or gal who cares about what they buy. Someone like you needs a cover to match! Well thank your lucky stars for the KUJALI Classic, a smart mini iPad cover that oozes class and sophistication. Inspired from Africa its lined with a super soft red suede interior, contrasting with a sleek black leather outer to make you stand out from the crowd. Style, protection and function is what this little wonder is all about. With its fantastic shock absorbent silicone skin and PU shell protection, you will be relaxed when out and about with your beloved iPad mini, happily knowing that all four corners are completely covered in case of that accidental bump or drop. With integrated volume controls and dust plugs the silicone skin keeps your ipad mini scratch free and looking as good as new for years to come. Pull together the front and back leather covers with the exterior strap closure and slide your hand into the soft suede integrated handstrap to comfortably hold your mini in one hand. Perfect for presenting at work or jumping back into your favourite book. And when ready to unwind after a hard days work, pop open your KUJALI Classic to kick back your iPad mini into one of the indentations to give you the perfect angle for watching a film. When you’re done, the embedded magnets in the front cover will put your iPad mini to sleep and the integrated strap closure keeps it safely shut, ready for another exciting adventure tomorrow. To top it off, for every protective iPad Mini cover you purchase KUJALI gives a mosquito net or life saving treatment to protect a child in Africa from malaria. Style never felt so good!